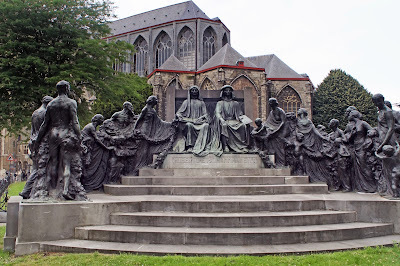 The monument is built in honor of the brothers Hubert and Jan Van Eyck, the painters of the Lamb of God in the Saint Bavo Cathedral in Ghent. They are also known as the inventors of oil painting. The monument was solemnly unveiled by King Albert on August 9, 1913. The architect of the artwork is Valentin Vaerwyck. The images are made by Geo Verbanck. The monument was built on the occasion of the World Exhibition that took place in Ghent in 1913. It is a tribute to the painters. Men, women and children bring flowers, wreaths and garlands. Hubert, the eldest of the 2 brothers, leafs through the Bible and his painter's palette and brushes lie at his feet. Jan looks ahead and holds his palette of paints in his hand. Rgey sit on a throne in the typical costumes of their time, which suggests the renaissance of Flemish art. The two painters of the Lamb of God sit with their backs to the Vijdkapel of the cathedral, where the painting originally hung.